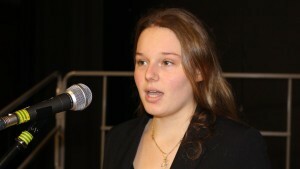 Mary wins Rotary District 1090 Young musician Finals. Mary Eckert, runner-up in the Banbury Young Musician senior singing section went one better in the District Finals last Saturday, winning the competition and securing a place in the forthcoming regional finals to be held at the end of March. The Tudor Hall student impressed the judges with her virtuosity by singing “Vedrai Carino” by Mozart, “Somewhere” from Leonard Bernstein’s West Side Story (the piece she sang at one of this month’s Purple4Polio Concerts at St Mary’s Church Banbury) and “Per La Gloria D’Adorarvi” by Giovanni Bononcini.